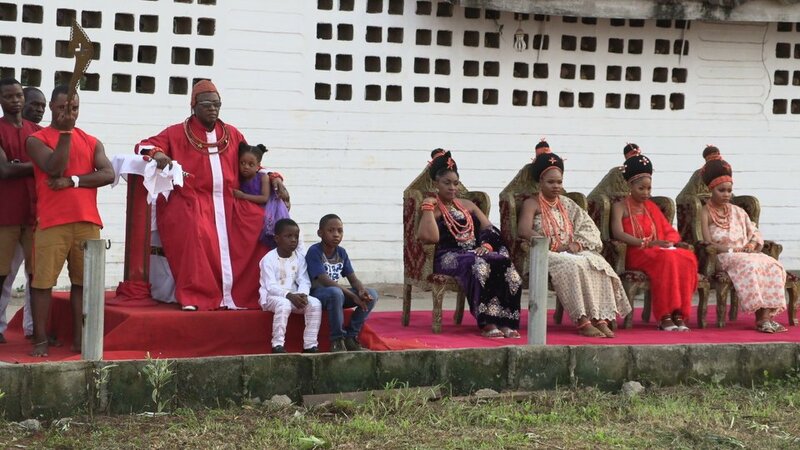 The Oba of Benin, Oba Ewuare II, was pictured with his four beautiful wives during the first public performance of Ugie Ododua ceremony which commenced on Tuesday in the Oba’s Palace in Benin city, Edo state. What beats me is why a woman will agree to marry a man that is already married to another woman. I can't stand knowing that my husband is doing it with another lady. What really makes women accept that; money? Do not tell me that it is culture, no woman wants a co-wife if we want to be truthful to ourselves. No woman ever wants a co-wife I agree. The only traditional ruler in Nigeria with a wife is rhe ALAKE OF EGBA LAND. He was asked in an interview why he did not marry more than one wife, his reply was that he had no need for more. You need cane or koboko? Not all polygamists are rich o. So, its not money. Some women dont mind. 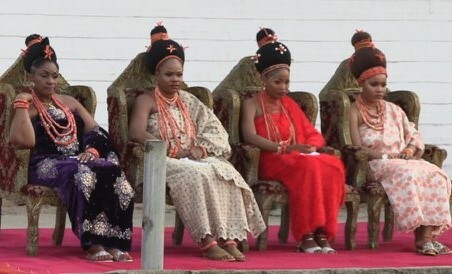 African tradition and culture permits monarchs to marry more than one wife. Kidjo, I understand his position in his Kingdom. I'm not faulting him for marrying more than one. I was actually surprised when I came across the ALAKE'S interview because it was rare to find one without more than one wife. Kidjo, he's not just a man? What is that supposed to mean? Is he God? And leave her tongue alone, she may be referring to polygamy ad a whole before you start hyperventilating over your oba. Someone that will still end up under 6feet. It's like he married this 4th after he ascended the throne. Na 3 I know. The Alake ascended the throne as an old man. It can't be more than 10yrs or over so taking a wife now. He is also very enlightened and a principled man so that lifestyle of wives won't suit him. Beds and roses - that old man ascension to the throne, does not hold water. It is how he is as a person (yes enlightened and principled) and he has a very tough Dr wife. To avoid the stress he didn’t marry a second wife. This is also similar to the late Osemawe of Ondo, the late Oba Adesanoye. A man that values his wife and kniws that she can't accept such won't dare marry snithan wife. He might have a concubine without her knowledge, not marrying up and down openly. Me, I can not condone such iberiberism. Bed and roses, I do not think ALAKE'S age has anything to do with his decision. He may not like the idea of Polygamy. The Oba of Benin is also enlighten, lived in different countries as Nigeria's Ambassador. ALAAFIN still married younger wives at his age. Occultism to the highest order! How do these people sleep at night? How can you deliberately allign yourself with Darkness and be happy? Just because of wealth and affluence? Na wah! Occultism kwa?! So because its traditional practice and not Christanity it is darkness? KIDJO I'm not surprised okay, as if I have forgotten that you're a 'member' Namsense in blog Lord's voice. anon 14:38 Will you keep quiet? Occultism kill you there!!!! Just 4 wives? e dey learn work for where Mswati III dey. They are beautiful and the kids too. Beautiful women....I be Queen too...I just need a king to metamorphos to a complete one. You're funny. Come to me now. Heard the last wife was given to him after coronation and was just 16 years or so. I am not sure about the age. But the girl is very young. Looks under 20. I married her after coronation. Modellla and Kidjo, love you sis. Good representation of our revered Oba, you did on this post.